MMN Says Thank You to Our Veterans! The Minority Men’s Network includes a number of men who have served in one or more branches of the Armed Forces. To those men, we say THANK YOU for your service and for being part of the Minority Men’s Network. As we commemorate Veterans Day, the Network also says THANK YOU to ALL the men and women in our community who have served in the Armed Forces. We hope your day has been a good one and that we never forget those who gave the ultimate sacrifice in service to our country. THANK YOU every day, but especially today Veteran’s Day, from the Minority Men’s Network. The Missouri Institute on Minority Aging (MIMA) will conclude their 18th Annual Conference today in Columbia, MO. The theme of this year’s conference is “Brain Health: A Key to Health Aging” and the program featured a variety of speakers and concurrent presentation, as well as social activities for participants. Mr. Sehon Williams is an active member of this group and serves as a lay leader for the Paula J. Carter Center on Minority Health and Aging (PJCCMHA), as well as the planning committee for this annual event. 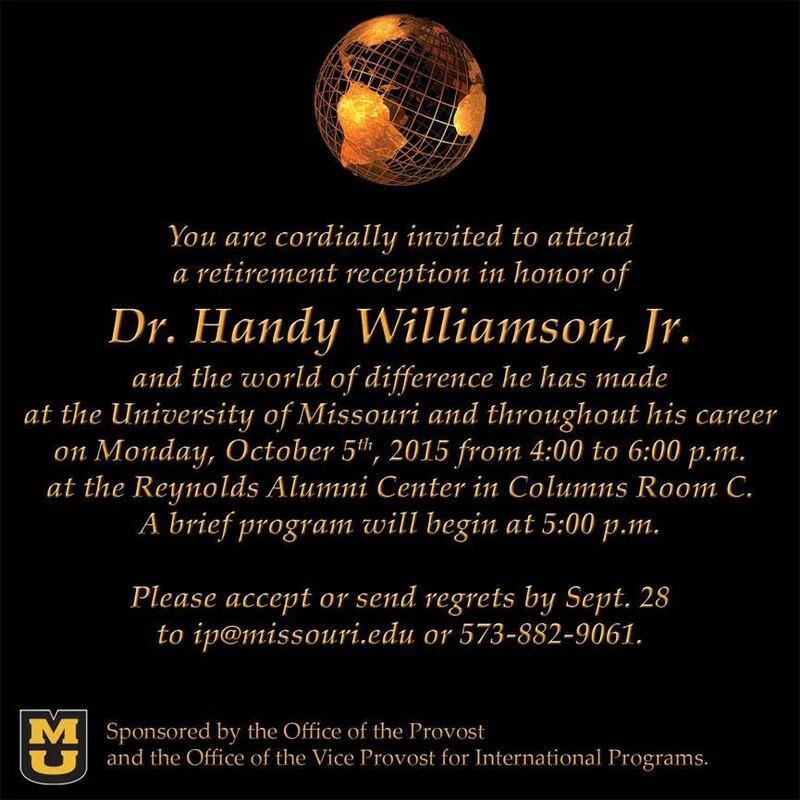 Williams is also a Lincoln alum and engaged member of the Minority Men’s Network in Columbia, MO. Steve Calloway also participated in the MIMA Conference, speaking on the topic of The Senior Brain: Getting to “Safer” Regarding Medication Use. Calloway is a pharmacist and President of the Minority Men’s Network. The Paula J. Carter Center on Minority Health and Aging (PJCCMHA) was established in 1997. The PJCCMHA is a multi-ethnic community outreach, education and public policy center administered by Lincoln University Cooperative Extension (LUCE). The primary purpose of the center is to improve the quality of life for Missouri’s aging minority population by reducing disparities and inequities in access to health-related care, literacy and behavior. Our Mission is to provide leadership in addressing the health, social and psychological needs of Missouri’s 50 and older minorities and the underserved population. This is accomplished through education, research-based information, policy analysis and the use of technology as strategic tools. develop innovative community-based demonstration programs that enhance the quality of life for Missouri’s minority elders. 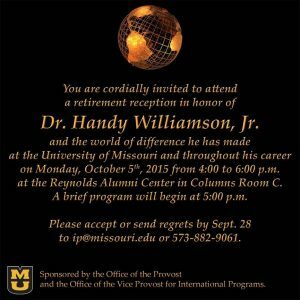 The University of Missouri invites you to join colleagues and friends for a reception in celebration of the leadership of Michael Middleton, JD and for his 30 years of service to Mizzou. (Invitation attached). The reception will be held in the Great Room of the Reynolds Alumni Center – 704 Conley Rd, from 4:00 to 6:00pm. The formal program will begin at 4:30pm. A memory book is being created to commemorate Michael’s years of service to MU. If you have any questions or wish to send a note directly, please contact Julie Middleton at middletonj@missouri.edu. Dr. David Mitchell gave a presentation on Wednesday, August 12, 2015 to the Columbia Citizens Police Review Board (CPRB). The topic of his presentation was: “Deconstruction of Police-Citizen Interactions and the Salience of Race and Ethnicity”. Mitchell has given timely and informative presentations previously to the CPRB, as well as to the Mayor’s Task Force on Community Violence on police and citizen perceptions and interactions. Professor Mitchell, an interdisciplinary scholar whose research focuses on the criminal justice system, specifically the collateral consequences of a criminal conviction, joined the University of Missouri School of Law faculty in 2006. He has served as a Missouri Supreme Court Faculty Fellow researching ex-offender reentry in Missouri. Prior to joining the faculty, he was a Scholar in Residence in the Department of Sociology at the University of Colorado at Boulder and served as a law clerk to the Honorable Andre M. Davis, formerly of the U.S. District Court. He has been recognized for his teaching – Gold Chalk Award (2009), and his contributions outside the law school – Legion of Black Collegians Minority Faculty and Staff Appreciation Award (2011). In 2012, he earned his doctorate in Sociology from the University of Pennsylvania with his dissertation entitled, “Unintended Consequences? : An Interdisciplinary Exploration of the Obstacles that Prevent Successful Ex-Offender Reentry and Reintegration and the Societal Impact.” He is an affiliate member with the MU Black Studies Program and a Policy Research Scholar with the MU Institute for Public Policy. Carl Kenney is co-pastor of Bethel Baptist Church and an adjunct professor at the Missouri School of Journalism. He writes a weekly column for the Columbia Missourian. The program, which airs at 7 p.m., will explore a joint learning project between the Tribune and the Kettering Foundation. Panelists Sarah Read, Peggy Placier and Robert Ross will join moderator Jim Robertson, the Tribune’s managing editor. The Tribune project, called Trib Talks sessions, aims to amplify the influence of residents in local government through in-depth discussion of issues participants deem important. CAT-TV airs on channel 85 on Mediacom, channel 983 on Charter Communications and channel 98 on CenturyTel Prism. The program will be replayed at 7 a.m. Tuesday, Thursday and Saturday and 7:30 p.m. Monday, Wednesday, Friday and Sunday. The program also will be available on the League of Women Voters website at lwvcbc.org a few days after the original airing. We received word that Dr. KC Morrison’s mother, Elvestra Morrison, passed away on June 17th. KC states that he and his sister Elizabeth are doing okay as they gain perspective. A service was held Sunday, June 21 at 2 pm at her home church, Cherry Grove MB Church on Mt. Moriah Rd in Edwards, MS. I apologize for this late notice. The Minority Men’s Network expresses our sincere condolences to KC and his family at the loss of Mrs. Elvestra Morrison. The Minority Men’s Network 2015 Summer Retreat was held on Saturday, August 1st from 9am to 1pm. The meeting was hosted by Bishop Lester Woods at the Urban Empowerment Church on Industrial Drive. The meeting was a focused work session to review our activities for the previous year and make plans for the year as we resume Fall 2015. We had a very productive meeting and covered a number of important topics, while establishing our priorities going forward. Stay tuned for updates on what’s going on and how YOU can be involved in the Network’s activities. Thank You to the men in attendance and to Bishop Lester Woods for hosting the meeting. Mr. Sehon Williams Celebrates Birthday! The Minority Men’s Network sends out a “Happy Birthday” to Mr. Sehon Williams. This weekend marks Sehon’s 93rd birthday and he will celebrate with friends and family. Sehon is not only a living legend among Network members, but he is an active community member. Williams was a member of the Sharp End Historic Project, was part of the Douglass High School project resulting in recognition of Mrs. Beulah Ralph, and is a living historian on Columbia Minority History. He also serves on the Advisory Committee for the Missouri Institute for Minority Aging (MIMA), is an active supporter for Lincoln University. Sehon was also a member of the Guardians, the African American group that preceded the Minority Men’s Network. We are proud to have Sehon as a former officer and board member, current Scholarship Committee member, and regular First Friday attendee with the Network. Congratulations and many more Happy Birthdays!